Dance your lederhosen off at our many festivals. Ride through our scenic river valley or explore the oak-shaded bluffs and sand-bottomed pool of Flandrau State Park. Stroll around downtown and hear history – and our 45-foot-tall Glockenspiel – come alive. Toast one of America’s oldest brewing traditions at the August Schell Brewery. Or take a breather – and take in the breathtaking view – from high atop Hermann Monument. In New Ulm, we’ve been crafting fine brews and much, much more for more than a century. Settled by German immigrants four years before Minnesota became a state, today this community 90 miles southwest of Minneapolis/St. Paul offers something for everyone, from one-of-a-kind shops and restaurants to important historical sites, inviting bed and breakfasts and a steady stream of live music and lively conversation. Most importantly, it’s still a place where friends old and new are greeted with a warm welcome. We invite you to take a look around our website and see what makes New Ulm so unique, and then contact us for help planning your visit. 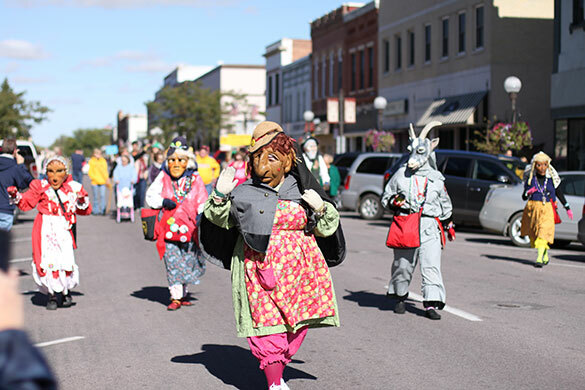 We promise you’ll want to come back again and again – because in New Ulm, there’s always something special brewing.